A large family meets Land Rover's seven-seat SUV, and spends six months together. 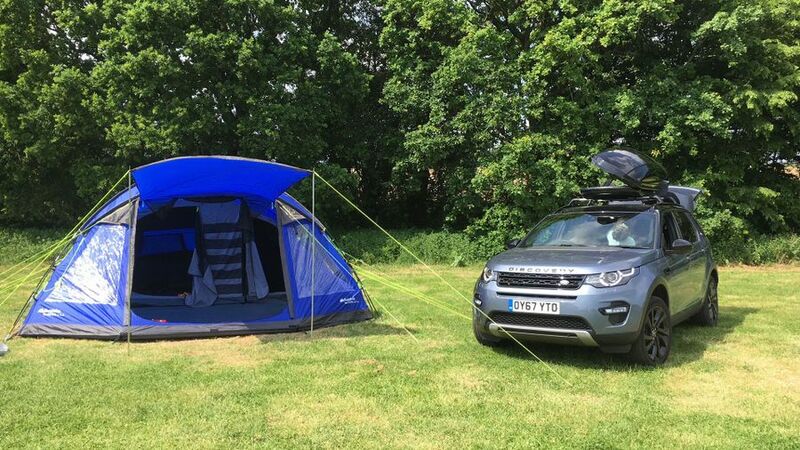 Here's how we've got on with the Discovery Sport. Six months with a new Land Rover Discovery Sport has started in noisy fashion, and I’m not referring to all four of our boys in the back two rows of this small seven-seat SUV. I’m talking about the car alarm. I had a call from my neighbour at work. “Can’t hear you”, I said, “some horrible alarm in the background.” “I know”, he yelled back at me: “it’s your bloody car alarm going off outside my house.” Mea culpa; one of the boys hadn’t quite shut the front passenger door and although the car did lock, it bleeped as it did so, which I unwisely ignored. Lesson learned. We swapped a full-fat Land Rover Discovery for this Disco Sport. The former is a big car, with plenty of room for seven adults as it has two full-size rear seats in the third row, plus enough boot space with the third row up for two shopping bags. On the other hand, it got very tiresome trying to park it on our over-crowded residential street in London. Could we get away with the smaller seven-seater, the Discovery Sport, which is the much better-looking successor to the Freelander? First impressions are a mixed bag. The Disco Sport, which is by far and away the biggest-selling model Land Rover currently sells, is a breeze to park, which is a big tick; it really doesn’t feel much more cumbersome to manoeuvre than a Ford Focus. Also, it has the same 2.0-litre diesel engine as the bigger Discovery, so, in the lighter Disco Sport, you get far more bang for your buck from the engine. The acceleration markedly improved, as well as the fuel economy, slightly (we're getting about 35mpg at the moment, which is 3mpg more than than the same engine in the larger Disco). The car also has a lovely thin steering wheel, which adds to the sense that you are driving a lighter, more agile car. On the other hand, this is almost a five-plus-two seating arrangement rather than a full seven-seater. The third row of seats comprises seat bases nailed to the ground and the backs pull up from the boot floor. What that means is that the children sit far lower down than in the Disco, with a hindered view of the road ahead, unless they’re on thick boosters. Sitting them in car seats also tends to jack their little legs straight out, which means you must slide the individual second row of seats forward to make room for them. Having done that, there’s room for all our boys in the two rows - they are five, seven, eight and 10 years old - but what you sacrifice entirely is a boot. We just about managed to lie their coats along the remaining space. It’s not a major problem, because we are a blended family so only have all four boys perhaps one or two days a week - if we were a full-time six-person household, this car would be too small. To counteract the loss of boot space, we’ve got a top box from Land Rover which clamps onto the roof rails of the Disco Sport. This is fine, except when entering car parks with low roofs. I suddenly remembered it was on when I went to pick up my boyfriend from Heathrow Airport, so decided to take it off on my own. Mistake number two with this car. I undid the clamps with no problem, but underestimated how heavy it still is when empty, and rather lost control of the box on its departure from the car. It slid noisily off the rails and crashed onto the pavement, but seems unharmed, as is the car, thank goodness. Just my pride, then. We’ll see over the next month how the electronics in this car’s £2,245 infotainment system (Meridian Digital Surround Sound System with 16 speakers plus subwoofer, Pro Services and Wi-Fi Hotspot Navigation Pro) behave; they badly let us down in the Discovery, and we don't fancy that huge extra expense for the upgraded system, either. On the other hand, we took it camping with all the boys last weekend and were very glad we had the four-wheel-drive when the field turned into a quagmire the following morning. We have discovered the very best thing in the Disco Sport that we’ve had in a car for a few years now: a CD player. Out come all the long (my partner would say best) forgotten Yazz and the Plastic Population albums. Unfortunately, infotainment problems experienced in our previous Discovery persist in the Discovery Sport. It has taken to saying DAB is sometimes unavailable when we’re in the middle of London, in a spot I know is fine for DAB. And sometimes the iPhone music doesn’t connect through the USB slot, which is incredibly annoying in a car this expensive; the system switches to the relevant media source but the songs won’t play, either via the touch-screen or the iPhone screen. We also miss the option of Apple CarPlay, the system which allows you to access all the iPhone functions like text messages, calls, Google Maps and your music through your iPhone, via Siri or the screen. Many much cheaper cars from other manufacturers provide Apple CarPlay as standard. We’ve been using the Disco Sport to help us move house, shifting box after box halfway round the M25 with the second and third row of rear seats folded flat. There is still a ridge in the floor created by the second row of folded seats, but once you get your furniture over the hump, there’s an impressive amount of space for a car with the medium-sized footprint it has, in terms of length, width and height. 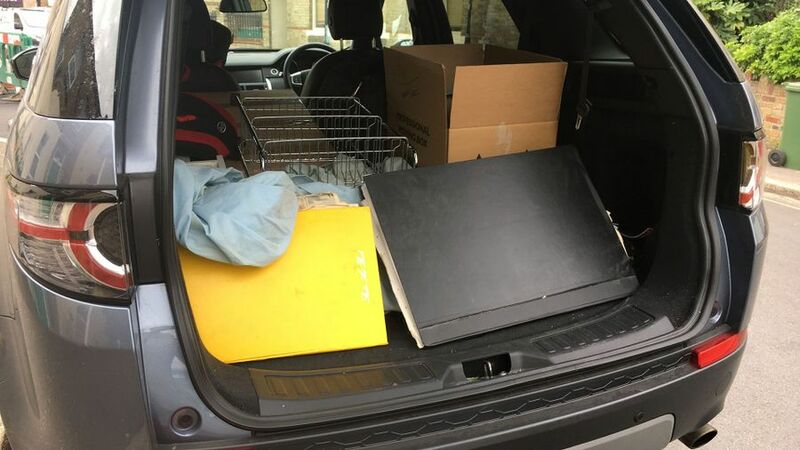 We’ve loaded up ten big framed pictures, a family suitcase full of clothes, some shoe racks, two big holdalls and five dustbin sacks of clothes, with no problem. The car’s black gloss wheels look really great, but I can’t help wondering how long it will be until I kerb all of them, given the small public spaces available. 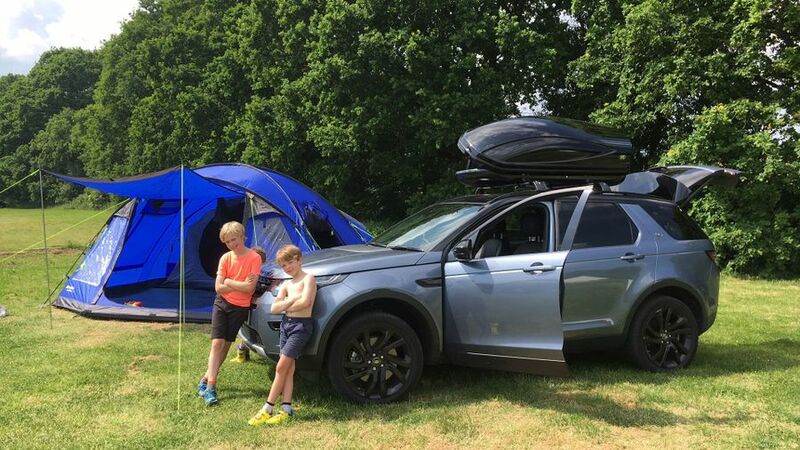 The boys don’t seem to mind sitting down low in the third row of seats; the car is undoubtedly comfortable enough for a family of six over long distances, as long as that family has young children and no luggage. Almost five months through our ownership of this Land Rover Discovery Sport, only one thing has required our attention, which was a warning message saying the exhaust diesel fluid (EDF as it’s known in the industry) was running low. Obviously, being an archetypal British motorist, I ignored the message for as long as possible, but then it said I had only 100 miles to go and the car needed 10 litres of EDF, which sounded like a huge amount. If you own a diesel car, the chances are high that you’ll have to top up your EDF at some point between services; it’s basically a fuel additive to help decrease the amount of gremlins being emitted by your engine. Running out of the stuff increases emissions which is bad at any time, and particularly bad news politically at the moment. It could also cause your engine to seize up, so best not to ignore it. The best known EDF is AdBlue, which we’ve got loads more information on. We stopped off at Halfords and got a big plastic container of the stuff for £11. The Disco Sport’s AdBlue filler cap is under the bonnet and easily marked; we poured the whole lot in using a funnel and Bob’s your uncle; the warning light has gone out. Apart from that, it’s been plain sailing during our ownership, apart from the normal Jaguar Land Rover infotainment electrical glitches, like the system not recognising my Bluetooth connection sometimes, or playing a different song from my phone via the USB port than the one I selected. For the past few weeks, it won’t download any of the contacts or recent calls from my phone, although I can’t rule out having done something to my phone… as you can tell, I’m not the most technologically minded. The interior design is impressive, coping with four boys, mud, sand and general tough outdoor living. Despite mud and scuffs, the black leather and plastic still look smart. And I miraculously haven’t curbed the black gloss alloys which look the business. The one major personal quibble I have with this model is its fuel tank, which at 54 litres (11 gallons) feels too small for the sort of driving we do, and means visiting the filing station with boring frequency. I’m still averaging about 34mpg, as quite a bit of our family driving is in towns, on the school run and to the shops, which means about 350 miles between fill-ups. As a family, we’d prefer something went more like 450/500 miles between fill-ups. Hmm. Interested in buying a Land Rover Discovery Sport?